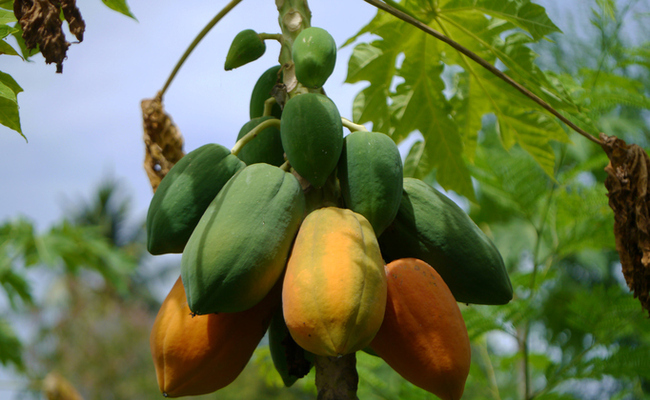 Are you ready to learn how to select a delicious sweet papaya? One with a soft buttery-like consistency, a papaya that makes your taste buds dance with delight. Learn how to choose the best papaya, storage tips and the best ways to eat them. Plus, get three delicious new recipes to get all the health benefits of papaya. Choosing the right papaya is very important, especially for those of us who live thousands of miles away from where they grow. Many have never tasted a fully ripe succulent papaya, so we don’t know how delicious they are unless we have traveled to a tropical climate. As the papaya slowly ripens on the tree, you can see stripes of orange along the full length. It is best that it has these stripes to show that the ripening process already took place. A papaya that was picked too early goes from green to orange all over the whole fruit with no stripes of color. Papaya will have smooth skin and turn yellow when ripe. It will be soft to the touch and if you press too hard it could damage the papaya. This is an indication that the papaya is ready to eat. A firm papaya will need a few more days to ripen. Choose a papaya that has a reddish-orange skin. If it still has yellow patches it will need a few more days. It is okay if there are a few black spots on the surface, but do avoid papayas that are overly soft and bruised. Peak papaya season is during the summer and fall, though you can usually find them all year. When you cut open a ripe papaya, it has an orange-yellowish flesh with many small black seeds in the hollow center. It is best to eat ripe fruit to get all the nutrients, whereas unripe fruit even contains anti-nutrients that can cause indigestion. When a papaya is partially yellow or slightly green, keep it at room temperature where it will ripen. To speed the ripening, put the papaya in a paper bag with a banana. Store a ripe papaya in the refrigerator and eat within a few days to enjoy the delicious sweet flavor. Please Note: Papayas can affect a Latex Allergy as papayas contain chitinases that are connected with latex-fruit allergy. For more information go to Health Benefits of Papaya. 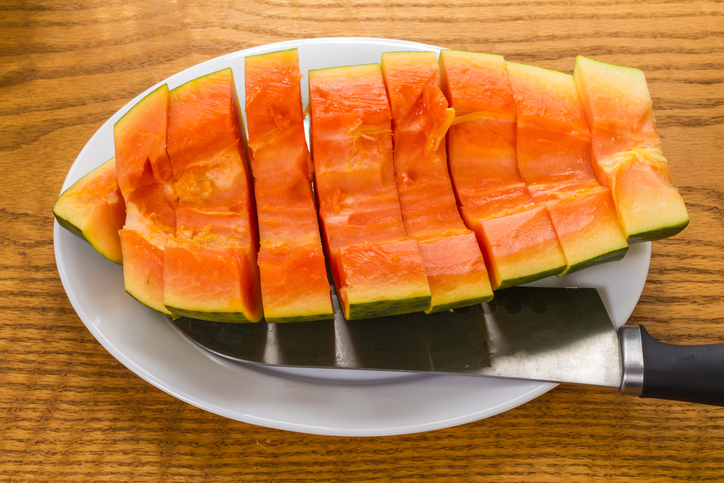 A tasty, easy way is to eat it just like a melon. Wash the fruit, cut in half lengthwise, scoop out the seeds and eat it with a spoon. Add papaya to a fruit salad. Use a melon baller and scoop out the halved papaya. Papaya can cause other fruits to become very soft so add it to a fruit salad just before eating. Low in calories, contains no saturated fats or cholesterol and is rich in dietary fiber and pectin. And yummy! 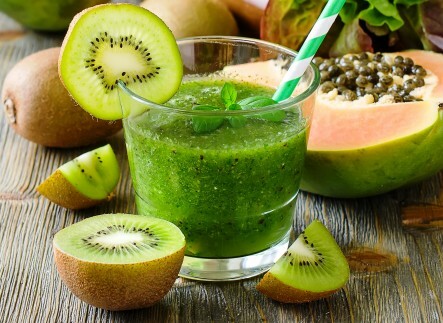 Learn 10 Reasons to Eat Green Smoothies. Peel and chop kiwi and papaya. Put all ingredients in your blender. An entirely green or overly hard papaya will never ripen or be juicy and sweet. You can still use them by cooking them, or using them in a salad such as a Papaya Asian salad. 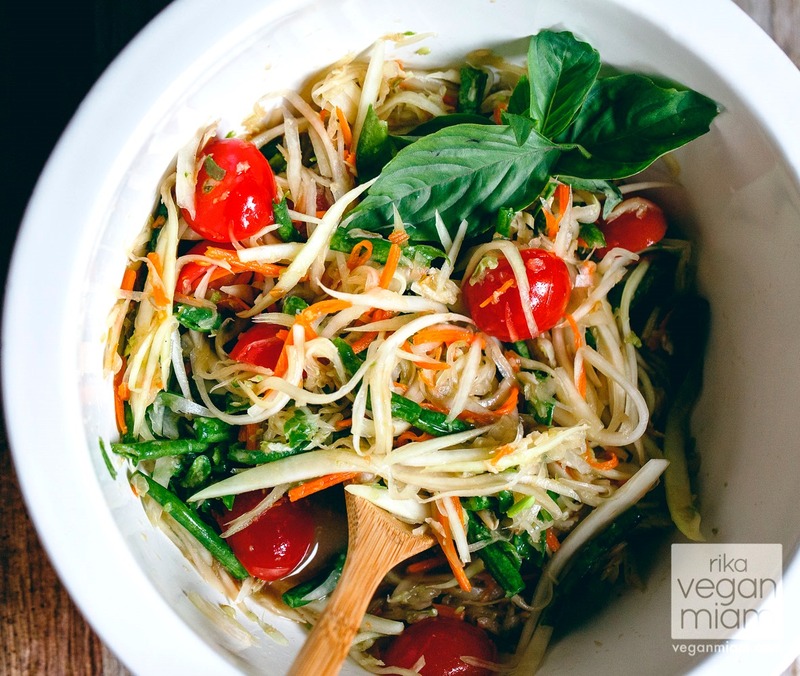 Here is the recipe: Thai Green Papaya Salad (Som Tam). The black seeds inside the papaya are edible too; they have a spicy, peppery and bitter taste and add flavor to a salad dressing. Now for my favorite papaya recipe, which I created this week. This is a very easy pudding to make for dessert and it is so yummy. 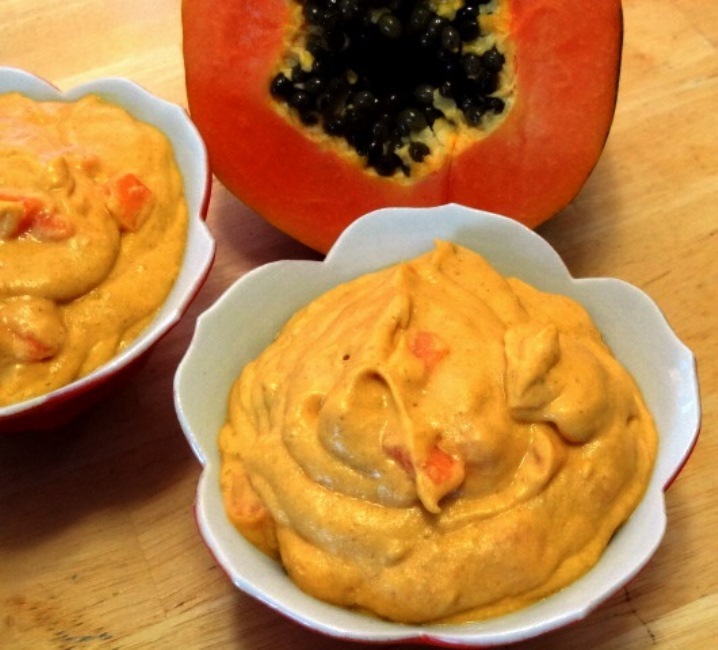 Blend the papaya in a blender. Add the nuts, chia seeds, honey and vanilla, blend until creamy. Put in the refrigerator for 20 to 40 minutes to thicken. Now simply mix the half cup of chopped papaya into the pudding.